A country of reliably fantastic weather, crystal waters and mile upon mile of fine sandy beaches, Egypt offers holiday experiences that can’t be found anywhere else in the world. From postcard-perfect beaches and weather conditions ideal for water sport enthusiasts, to secluded bays, romantic lagoons and castaway islands, the best beaches in Egypt come in all shapes and sizes. With the Association of British Travel Agents (ABTA) predicting travel to Egypt will boom in 2018, now is the time to seek out some of the best beaches the country has to offer. This modern Red Sea town is both unusual and romantic, made up of numerous islands that are connected by bridges. The result is a town of plentiful lagoons bordered by lush gardens and views of the water at every twist and turn. With natural beaches, water sports aplenty and buzzing marinas, this is a good-looking and immaculately kept destination. El Gouna is also Egypt’s most environmentally friendly holiday destination, having won numerous prestigious awards including the Green Globe. When it comes to beaches in El Gouna, visitors are spoiled for choice in high-end surroundings. Most of the beachfront is privately owned by a combination of hotels and homeowners. Despite the fact most are privately owned, you don’t have to be a hotel guest to access most of El Gouna’s beaches. For the active-minded, diving is available to do from just about anywhere. 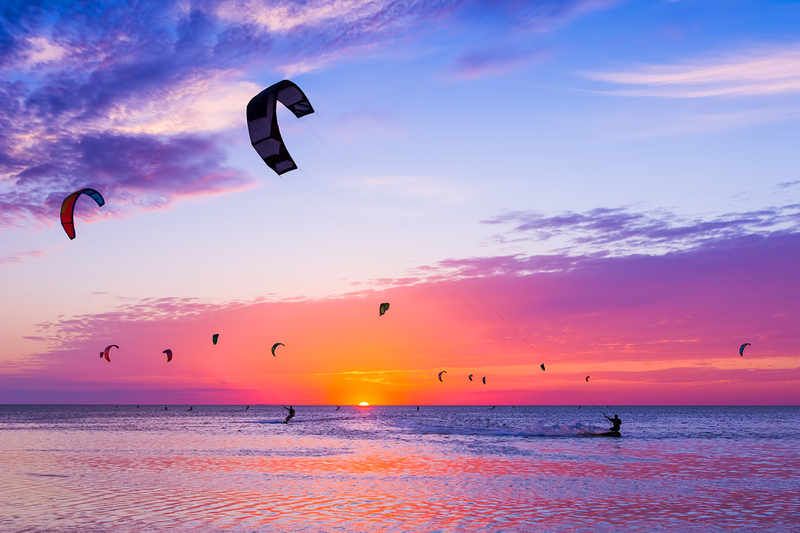 However, El Gouna has gained quite a reputation for its kite-surfing facilities. It’s the beaches in northern El Gouna that are best for this sport. Popular spots are Mangroovy Beach, the beach at Mövenpick Resort & Spa El Gouna – which also offers perfect views of the Red Sea from the 1,500m private sandy beach, and Zeytouna Beach. The latter is a great place for those who like to stay active in other pursuits. The beach itself hosts volleyball, football and dance sessions, while a 400m jetty is perfect for those who want to swim in deeper water and go snorkelling around the coral reef. Moods Restaurant and Beach Club has a low-key beach ideal for couples, with great food options and regular yoga classes. Couples visiting the Sheraton Miramar Resort El Gouna can take advantage of multiple palm-tree-pocked private beaches, a beach bar and beach volleyball – superb for holidays of the more laid-back variety. 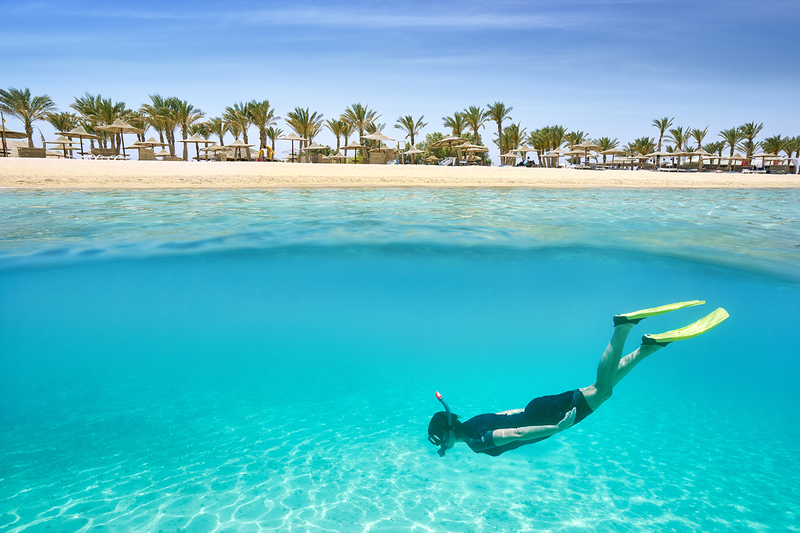 One of the first diving bases of the Red Sea, Hurghada is also known for its long stretches of beach by the Red Sea, snorkelling, windsurfing, sailing and deep-sea fishing. With an abundance of restaurants and nightlife too, it’s the kind of place you can be as chilled or as active as you want. With a dry climate year-round, bordered by clear and calm waters, there are plenty of places to find some of Egypt’s top beaches here. Hurghada has a mixture of public and privately-run beaches. Some of the most impressive are those run by the town’s hotels and resorts, bordered by pristine expanses of water. Steigenberger Al Dau Beach Hotel is a great family option, with a kids club, a sandy beach with loungers, and plenty of sand castle building opportunities. A dive club directly on the beach runs classes for children as well as adults too. The beaches most visitors to the region absolutely rave about are a short meander along the coast at Sahl Hasheesh Bay. With 7.5 miles of sandy beaches, crystal waters and mountains behind, this is a stunning location for a beach holiday in Egypt. The beach at Baron Palace is an impressive 600 metres long, with numerous secluded sections of beach to be found as you roam around landscaped gardens. It’s ideal for adults who want to unwind and relax, although there are areas of the hotel set up for family holidays too. Premier Romance Hotel & Spa – an adults-only hotel – is also perfect for its beachfront vistas and relaxing atmosphere. Hurghada is a great spot from which to explore the unspoilt beaches of nearby islands too. Mahmya beach on Giftun Island comes near the top of many travellers’ lists, with white sandy beaches, turquoise waters and the option to snorkel amid the coral reef. 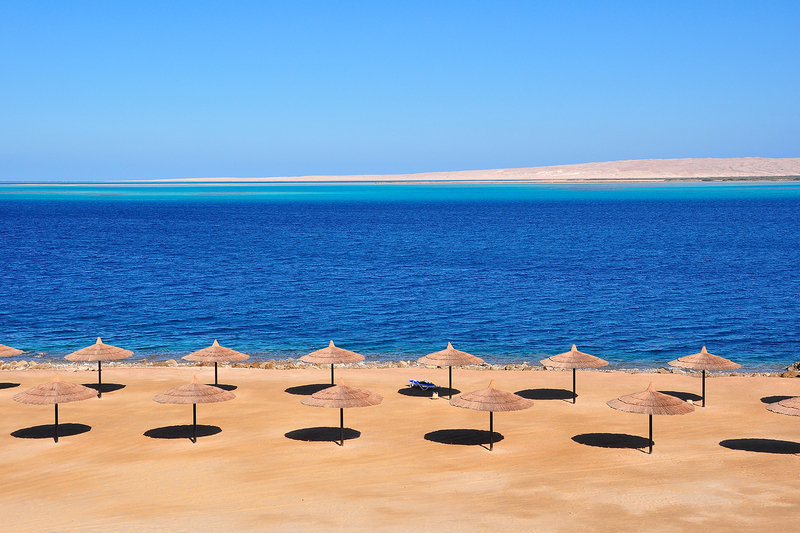 An exclusive peninsula on the western shore of the Red Sea, Soma Bay covers an area of just four square miles. On a piece of land jutting out into the Red Sea, this is a high-end spot characterised by white sandy beaches and panoramic sea views. 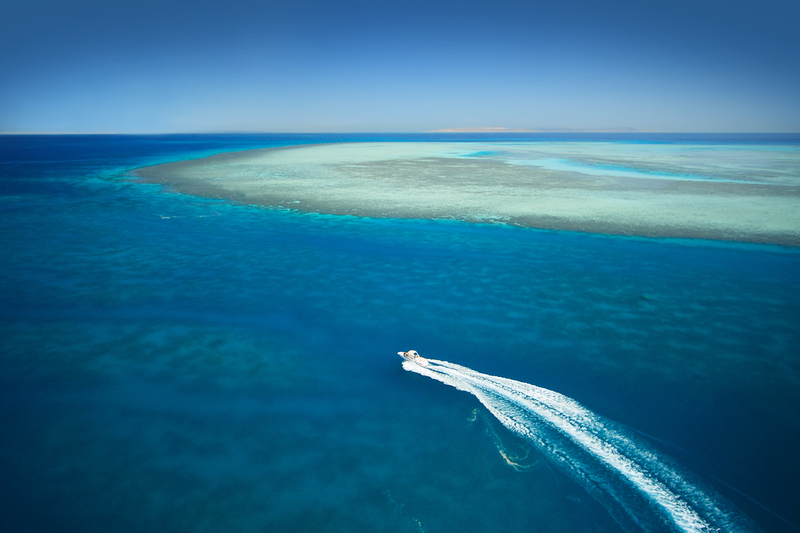 With plenty of opportunities for water sports, Soma Bay has been named as one of the top three kitesurfing spots in the world, due to its flat water and 300 days of wind per year. Given this location’s exclusivity, it’s via the high-end resorts at Soma Bay that visitors can truly enjoy everything the amazing beaches have to offer. Visitors to Sheraton Soma Bay can spend days relaxing on the beach, while romantic dinners on the beach can be arranged in the evening. A gorgeous jetty extends far out into the water – a charming feature ideal for dreamy sunset walks. Despite the many laid-back and romantic beach spots in Soma Bay, there are still plenty of options for those who like activity, with beach volleyball and water sports easily accessible. The Mövenpick Resort Soma Bay also has different spots along the beach ideal for couples, families and people looking for activity – with a diving centre and kite safari activities directly on the beach. Enjoying a commanding position at the top of the Red Sea, Sharm El Sheikh is a sheltered town on the edge of the desert offering some of the best beaches, diving trips and all the amenities of some of the most upscale resorts in Egypt. Na’ama Bay is a buzzing part of Sharm El Sheikh that is also the location of some of the best beaches. For long stretches of beach ideal for mixing up lazy days with water sports and beach activities, Baron Palms Resort and the Savoy Hotel in Sharks Bay come highly recommended by visitors. Although Nabq Bay has mostly pebbled and rocky beaches, the resorts located in this area are found on the sandy beaches. At a quieter end of Sharm El Sheikh, the sea by these beaches tends to be ankle-height, making it ideal for those who like paddling. Further out, a sudden drop in the ocean is perfect for swimming surrounded by fish and diving off the coral reef. Resorts such as Cleopatra Luxury Resort and Rixos Seagate Sharm in Nabq Bay make ideal locations from which to enjoy this area. Even visitors to Cairo don’t have to miss out on some of Egypt’s finest beaches, as Ain Sokhna is just a two-hour drive from the city. Near the top of the Gulf of Suez that leads into the Red Sea, this pristine stretch of beachfront is all about white sand, turquoise waters and palm trees swaying in the breeze on public beaches and the beaches of private resorts. It’s a place to spot pods of dolphins from the beach, snorkel amid fish of every colour and eat grilled food at beachside resorts. Various spots along this stretch of coastline are geared up for water sports enthusiasts too, with jet-skiing, windsurfing and kayaking all on offer. All-in-all, a visit to Ain Sokhna makes a fabulous and fun-filled day trip from Cairo. Beach fans are spoiled for choice when it comes to finding a beach holiday in Egypt. The unparalleled desert geography spilling towards the azure waters mean the best beaches in Egypt look like nowhere else in the world. Whether you want sun, sea and sand, or beach volleyball, diving and kite-surfing, Egypt’s beaches are the locations from which exquisite holiday memories are made.